Half duplex and full duplex are two communication channels in telecommunications and computer networks. These communication channels provide a way to convey information. The communication channel can be a physical transmission medium or a logical connection on the multiplexing medium. Physical transmission medium refers to substances that can propagate energy waves, such as lines in data communication. Logical connections usually refer to circuit switched connections or group mode virtual circuit connections, such as radio channels. With the help of communication channels, information can be transmitted smoothly. In this article: Half Duplex vs Full Duplex: What Are They, we will discuss half duplex and full duplex. We can note that half duplex and full duplex are duplex. Duplex products are very common, only in optical fiber communication products, and in terms of connectors, there are many kinds of duplex connectors, such as SC duplex connectors and LC duplex connectors. So what are half duplex and full duplex? What specific differences do they have? First, let’s focus on full duplex. Full duplex data transmission means that data can be transmitted in both directions at the same time. For example, in a LAN with full duplex transmission technology, one workstation can send data over the wire while another workstation is receiving data. Full duplex transmission must mean two-way lines (which can move data in two directions). Just like the full duplex data transmission we mentioned above, half duplex data transmission also means a two-way line that can transmit data in both directions. However half duplex data transmission refers that data can be transmitted in both directions on the signal carrier, but not simultaneously. For instance, on a LAN using a half duplex transmission technology, a workstation can send data over a line and immediately receive data on the line from the same direction in which the data has just been transmitted. Half Duplex vs Full Duplex: What Are the Differences? 1) In half duplex, both transmitter and receiver can send signals, but only one signal is sent at a time. The walkie-talkie is an example of half duplex communication. While, in full duplex, transmitter and receiver can send signals simultaneously. The telephone is an example of full duplex. 2) In half duplex mode, both devices connected to the link can transmit signals, but only one device can be transmitted at a time. In full duplex mode, all devices on the link can be transmitted at the same time. 3) The performance of full duplex is better than half duplex, because it makes better use of bandwidth than half duplex. The concept of communication channel plays a key role in understanding the operation of network. Half duplex and full duplex are two communication channel modes. Each of them can be deployed for different applications. It is more cost-effective to choose the right optical cable according to its channel mode. FS.COM has many good duplex products at logical price. If you have any other questions about the topic: half duplex vs full duplex or if you have need of high quality duplex products, please visit www.fs.com. This entry was posted in Connectors & Adapters and tagged duplex connector, half duplex vs full duplex, lc duplex, sc duplex connector on August 22, 2018 by Admin. High density has been a hotly contested subject in the world of data centers for years. Today’s cyber world is moving ahead at an incredible speed, we’ve seen an unprecedented the demand for high-speed and high-density in data center. And 40Gb/s and 100Gb/s are more commonplace and now become a trend and hotspot for data-center cabling system. In such a circumstance, we can predict that MTP fiber connector and MPO fiber connector will eventually replace the standards for fiber optics as known. High density networking is based on two components. One, being able to have concentrated port density. Two, being able to have large numbers of fibre cores connecting nodes of the network. 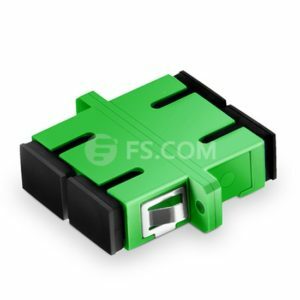 Most connectors (LC, SC, FC) have one fiber through them. The MTP/MPO connector has been designed as a “multi-fiber” connector. Going through the MTP connector wiki and MPO connector wiki, the MPO connector and subsequent standard were developed in the late 1980’s by the NTT-AT corporation. The MTP by US Conec corporation soon came after that with some additional features like a removable housing, elliptically shaped alignment pins, and the ability to change the connector’s gender. Current MPO connectors now offer these features. The main thing to remember is that the MTP connector adheres to the MPO standard. Therefore, MTP and MPO connectors are interchangeable. The MTP connector is the same size as a traditional SC connector. However, the MTP connector has 12 fibers to the SC’s one fibre. This 12 fold increase in density enables a much greater port density at any point on the network. There are also 24 fibre and 48 fibre connectors within the MTP range that are also the same size as an SC connector. The MPO fiber connector and MTP fiber cable connector can offer up to 12 times the density of standard connectors, providing significant space and cost savings. Due to this fact and its excellent performance in various applications, many manufacturers now offer a wide range of MTP/MPO products, such as MTP / MPO Cable Assemblies, Fanout / Breakout Cables, MTP / MPO Trunk Cables, MTP / MPO Fiber Optic Plug-N-Play Cassettes, MTP / MPO Adapters, MTP / MPO Fiber Optic Loopbacks and etc. With its higher port density, MTP/MPO fiber is easier to install – just pull 1 cable with 12, 24, or more fibers for one easy plug-in. Delivers big savings in installation time and cost. And High density MTP/MPO trunk cables can come with up to 288 fibers in a single cable. MPO fiber connector and MTP fiber cable connector offer ideal solution to set up a high-density and high-performance data networks with the advantages of time saving and cost saving. Considering the huge benefits it they have brought and their special role in the migration to 40/100 Gigabit Ethernet, MTP/MPO connector will definitely gain more and more popularity among data centers. This entry was posted in Fiber Optic Connectors and tagged MPO fiber connector, MTP fiber connector on December 8, 2017 by Admin.